We had a very simple and frugal Christmas this year. We thought we were doing to be out of town for Christmas day so I kept the decorating simple with our reusable tree and a few favorite decorations. 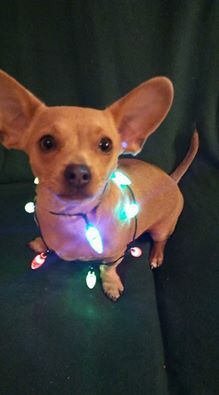 This has the added bonus of protecting most of our holiday decorations from the puppy. The tree didn’t fare so well as you can see from the above picture. This was our first Christmas with just the two of us and the fur babies and it was also our 8th Christmas together. On Christmas day, we slept in (a gift in itself because we are usually up so early) and then we opened presents. Many of our gifts to each other were practical and fun including a Kindle (on sale for $33 on Cyber Monday), a keyboard, work shoes, a scarf, new stove plates, a new phone, sewing supplies and clothes. 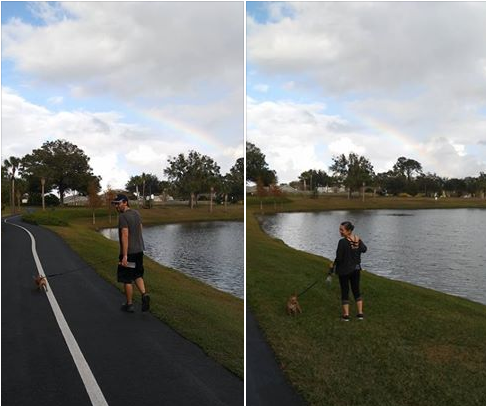 We watched a lot of Project Runway on TV and went to a beautiful local park with the puppy where we saw a fantastic rainbow. Not traveling this year saved us a lot of money so we had a lovely steak dinner with asparagus and loaded potatoes (from ALDI). Overall, a really great day! – Not buying any wrapping paper. We have some remaining gift bags from last year and I bought a red lined curtain at the thrift store for a few dollars that I have been using to make gift bags. – We also usually have a $10 gift limit in my family so the family members that I am giving gifts to won’t be expensive. – I bought Shugar Soap at Dollar Tree (but they sell for a lot more online) for my coworkers and printed little Thank You notes. They cost $1 and smell absolutely amazing (You seriously want to take a bite). They are also entirely vegetable based, chemical free and made in the USA. I missed some of my coworkers who had already gone on break so we ended up with some extras to give to someone else or use in our home. – I will be making some gifts and I have already bought the sewing supplies I need. Although my sewing skills aren’t up to making all gifts yet there will be a few I will sew. I doubt I will ever do 100% handmade gifts because it’s not always what everyone wants or needs, it’s not always cheaper, and it doesn’t ever save time but I will enjoy making a few that I believe my loved ones will want. 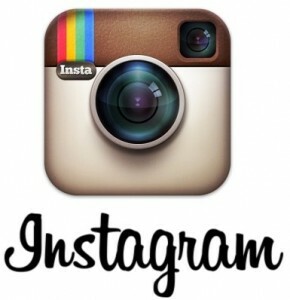 – Some of our gifts are from thrift shops. We don’t require that they are always new. – We are Amazon Prime experts. When it’s cheaper online with free 2 day shipping. It’s a win, win. – I got my mother a Kindle Fire on sale on Cyber Monday for $33 and we already exchanged gifts with her since she will be out of state for the birth of my nephew. – Playing Christmas music and watching Christmas TV is free. – I had some gift cards that I had never used and I used them to save money this December and to purchase gifts. – We own a tree that came with lights and we will use it again this year. 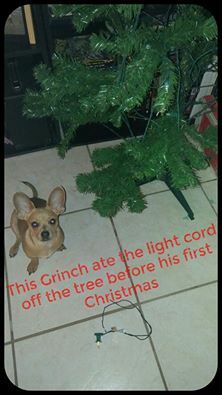 Our puppy decided to eat the light cord off but maybe we can fix it. If not, we will add lights we already own for free. 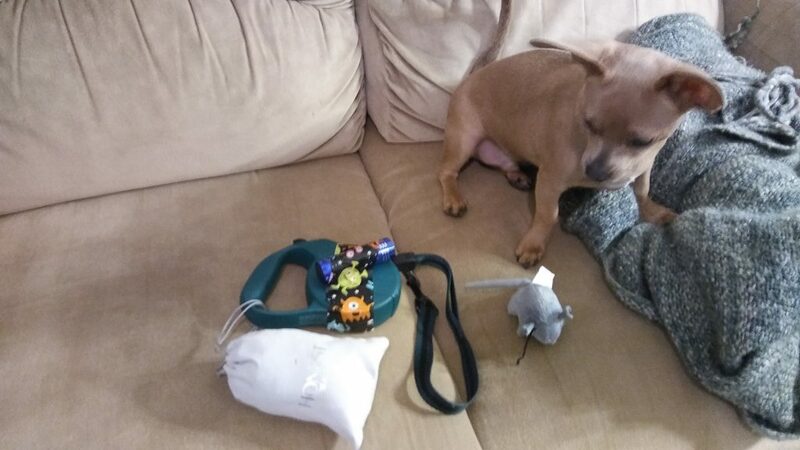 – I bought the puppy toys at Dollar Tree last month when I found some good ones and frankly he already has too many. My dad’s dog will get a bag of milk bones. We have a box and our puppy doesn’t like them. – Make all of the returns that have been sitting around the house waiting for me to find the time to return them. I will use the store credit to save money and/or make gifts. 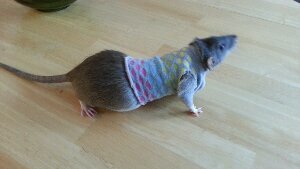 Am I the only one who loves to dress my unwilling pets up in outfits? For the most part they were good little models. So this is a reminder today to have fun with your pets. It’s why you have them, right? And they love it too (most of the time). 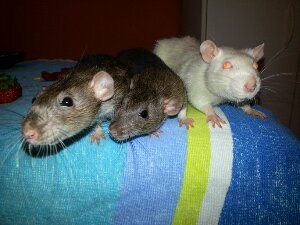 As some of you might already know, we are the proud parents to three really cute ratty babies. 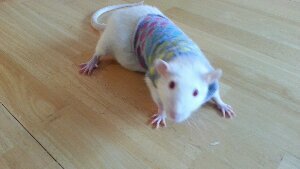 Rats are not the most common pets to own and I think that this is part of the reason that their food is $15 a bag if you buy the special rat food mix at the pet store. 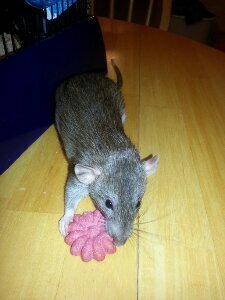 Since we have owned our rats, we have done a little research on what they can and can’t eat. We have also acquired through various means some various foods that we can feed them. 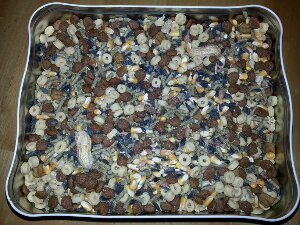 So I decided to mix them all together to make a rat food mix that actually doesn’t look too different from what they sell at the pet store for a lot less than $15 and they love it. 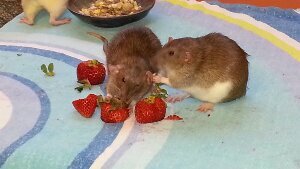 I should also mention that we feed our rats a large variety of fruit and vegetable that we are also eating. 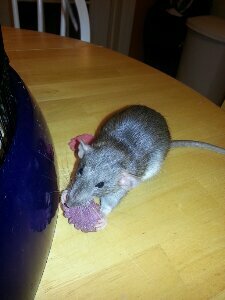 Our little rats eat a lot better than people in some third world countries. 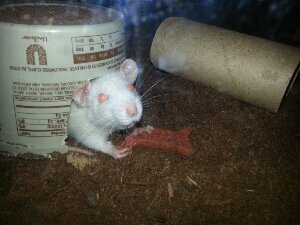 We recently bought two Dumbo rat babies so that our Albino Feeder rat turned pet, Benny, would have some friends. 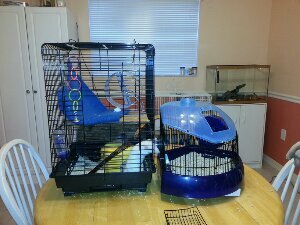 However, they don’t entirely get along so they are currently in separate cages and I had to buy them another water bottle. 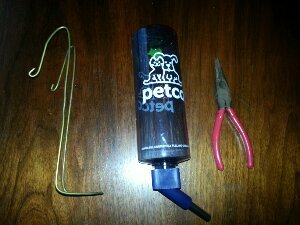 Rather than paying another $6 for a water bottle holder, we made our own from a wire hanger. Not bad for 5 minutes worth of work. 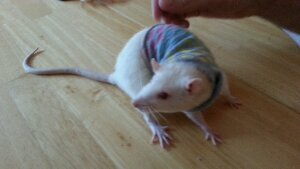 🙂 Click the Instagram button below to see a lot of cute pics of our ratty babies. 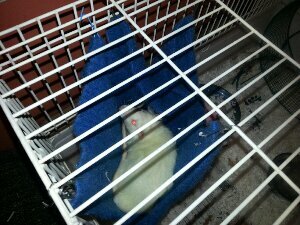 I saw a really cute, little, pet hammock at the Pet store and I thought that Benny (our pet rat) might like one. I didn’t want to buy one without trying to make one first. 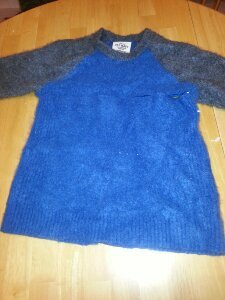 We have a lot of clothes that we don’t want, sitting in our garage, left over from our last yard sale so I picked out a sweater I thought might work. I cut it below the arms to remove the top and make a double layered square. Then I cut it in half at the seams to make it a single layer. If you use a thinner material you might want to leave two layers but this material was thick enough. 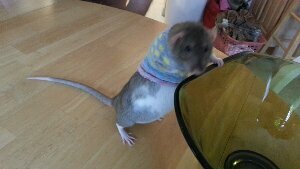 Then I took four large paper clips and clipped it onto the top of the cage. 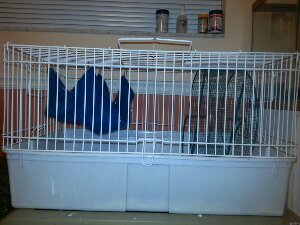 And Voilà a free pet Hammock! Benny wasn’t too sure about it at first. She liked the soft material but we did end up putting her house underneath it for more support. Now she likes to sit up there and chill. 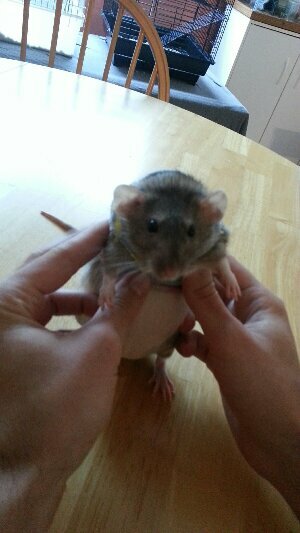 Recently we ended up with a small rat as a pet. In the above picture you can see Benny enjoying a Milkbone. (Our local pet store told us you can feed rats dog food). We weren’t sure we were going to keep him so we didn’t want to spend a lot of money on his house or toys. 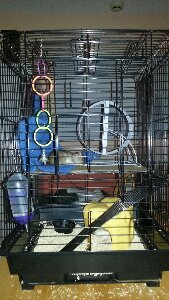 You can also see a toilet paper tube in the background, another favorite and free toy for small, rodent pets. We originally made Benny’s house out of an empty Country Crock container. As Benny got bigger, we got attached to our litttle guy and we realized he wasn’t going anywhere. 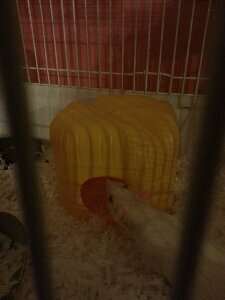 Now he is too big for his butter tub house so we made him a house out of the bottom of a milk jug. The indented circle on the side was also a great size for a door. 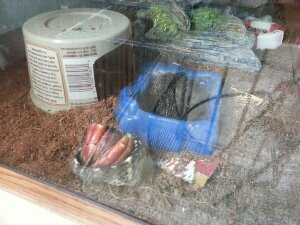 As I was writing, I realized that we had also made a butter tub house for our hermit crabs. Yes, the one in the picture above is on his back and no I didn’t have to help him get up. The point of all of this is that small pets are often very happy with toys and houses made out of household items that we often throw away. I know that these things can often be very expensive at Pet Stores and honestly our little friends don’t know the difference.